For its new store in Montreal, menswear boutique École de Pensée evokes an apartment-inspired feel that mixes modern and classic flourishes. 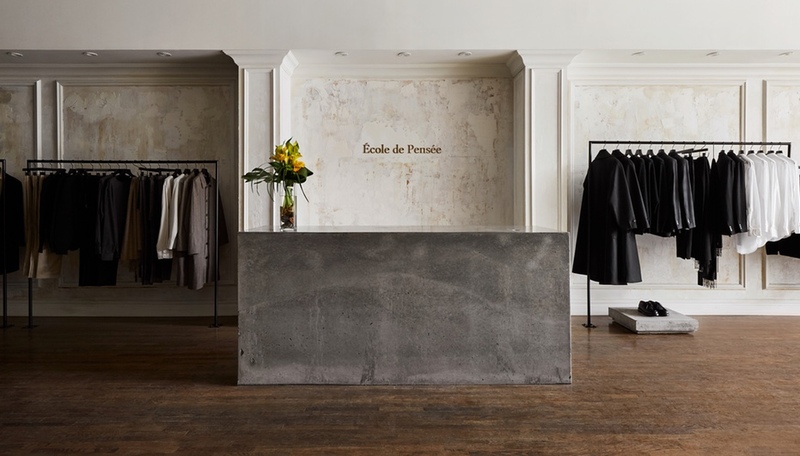 When Montreal men’s fashion line École de Pensée set out to create its flagship, the brand enlisted its own designers to create an interior that walks the line between timeless and modern, classical and fresh. 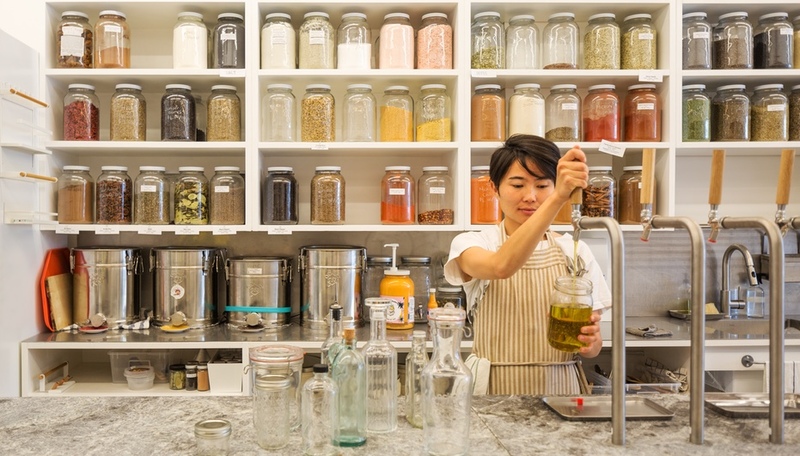 By subtly weaving elements from disparate design eras into their Avenue Laurier Ouest boutique – including Edwardian, mid-century modern and brutalist touches – the team proves that understatement and eclecticism can go hand in hand. 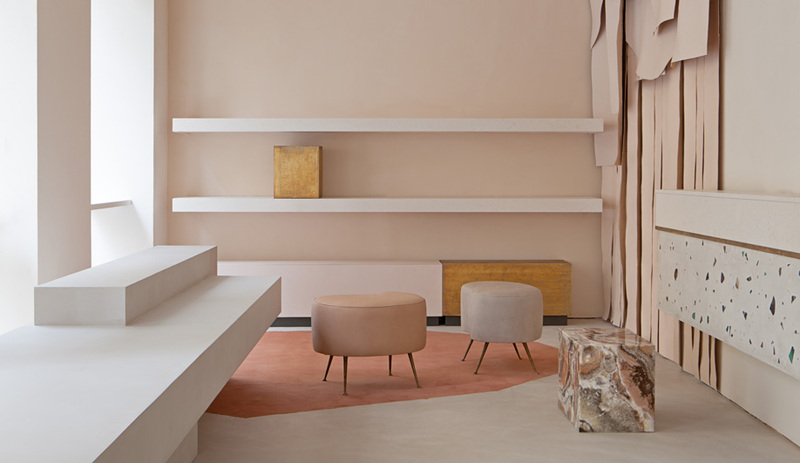 To evoke a welcoming “apartment-inspired” atmosphere within the three-storey brick storefront, the team began by finishing the 165-square-metre boutique’s walls with tinted plaster, building up layers using trowels and wet sponges, then sealing them with wood varnish to mimic the look of ancient, stripped-down plaster – a process they say took 250 hours to complete. Unlike the walls, the ceiling is a flat white, but both walls and ceiling are defined by prominent moulding that evokes Edwardian detailing; crown moulding frames the ceiling and rectangles of trim give it further depth, while all around the perimeter of the room, display nooks, mirrors, pillars, bulkheads and baseboards are decked out with elaborate trim. This pastel background serves as a neutral backdrop, contrasting with the existing stained-oak floor and newly added hardware elements, all in black steel. 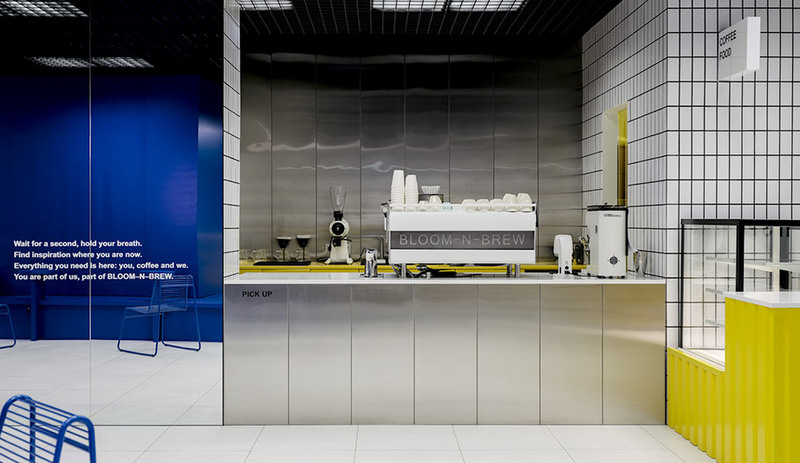 A rectangle of track lighting running the length of the interior echoes the geometric black lines of the shop’s clothing racks, custom-made in Montreal in freestanding and wall- or ceiling-mounted versions. 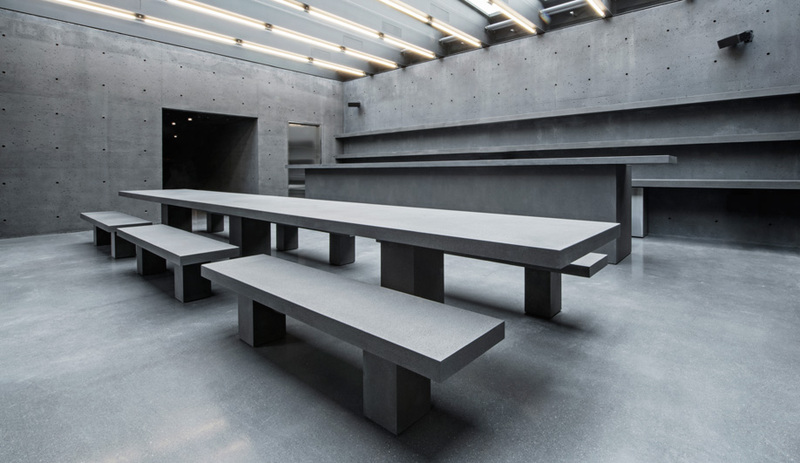 The geometric theme is carried still further in a series of raw concrete furnishings cast on site by the design team, including low display tables, plinths of various heights and the checkout counter. 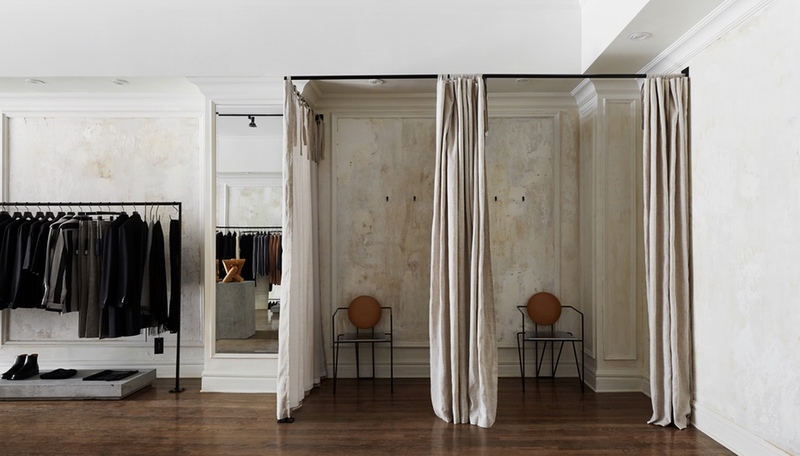 Tying together the minimalism of these clothing displays and the ornamentation on the walls and ceiling is a carefully staged selection of mid-century modern furnishings. 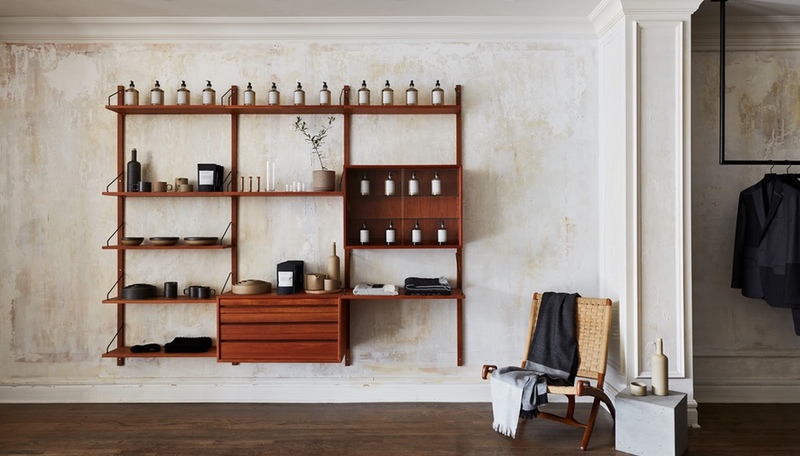 Between displays, a teak sideboard, a vintage Ebert Wels Folding Rope Chair and a Finn Juhl Model 138 sofa ground vignettes that evoke the feeling of stepping into a cosy apartment, while modular shelves – including a show-stopping Teak Angle shelving system by Poul Cadovius – display the shop’s assortment of Hasami porcelain, Toyo-Sasaki glass, and body care products.